Feeling sad and lonely after the death of a loved one is a natural component of grief. And there is plenty of help available, from individual therapy to grief groups for people who have suffered a similar loss. But when do you know that feeling has shifted into something that you need to worry about? Learn more about navigating the grief process in Grief Is a Journey: Finding Your Path Through Loss. The first reason to seek professional support is that you believe you might need or benefit from grief counseling or group support. Even if your grief is not complicated, such support can help in a number of ways. First, it can reassure you that your reactions to this new and difficult reality are what you might expect. It is often common, especially as you experience your first significant loss, to wonder if your reactions are unusual or problematic. Counseling can reassure you that these reactions are natural and normal responses to a situation that is anything but normal or natural. Second, you can explore the ways you are coping—acknowledging your strengths and learning to compensate for any weaknesses in coping. Here you can better deal with difficult situations. Finally, counseling offers tangible support, as well as the reassurance that you can get through your loss. You also should consider grief support when your own support system is limited or unavailable. As you age, you may find that you outlived many of the people you once counted upon to help you get through a crisis. In other cases, for example, if you are away at college, deployed with the military, or working far from your home, you may have a support system that is either dispersed or distant. Here support groups or counselors can fill in the gap. If you’re not yet ready to talk to someone, try one of these books to help you as you move through your grief. They’re not a replacement for a real person, but they’ll help you start the process. 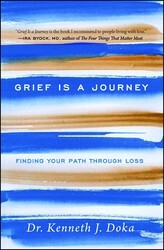 In this “volume of rare sensitivity, penetrating understanding, and profound insights” (Rabbi Earl A. Grollman, author of Living When a Loved One Has Died), Dr. Kenneth Doka explores a new, compassionate way to grieve, explaining that grief is not an illness to get over but an individual and ongoing journey.There is no “one-size-fits-all” way to cope with loss. The vital bonds that we form with those we love in life continue long after death—in very different ways. Grief Is a Journey is the first book to overturn prevailing, often judgmental, ideas about grief and replace them with a hopeful, inclusive, personalized, and research-backed approach. New science and studies behind Dr. Doka’s teaching upend the dominant but incorrect view that grief proceeds by stages. Dr. Doka helps us realize that our experiences following a death are far more individual and much less predictable than the conventional “five stages” model would have us believe. Common patterns of experiencing and expressing grief still prevail, yet many other life changes accompany a primary loss. For example, the deaths of parents, even for adults, modify family patterns, change relationships, and alter old family rituals. Unique to this book, Dr. Doka also explains how to cope with disenfranchised grief—the types of loss that are not so readily recognized or supported by society. These include the death of ex-spouses, as well as non-fatal losses such as divorce, the end of a friendship, job loss, or infertility. In addition, Dr. Doka considers losses that might be stigmatized, including death by suicide or from disease or self-destructive behaviors such as smoking or alcoholism. And finally, Dr. Doka reminds us that, however painful, grief provides opportunities for growth. Dr. Kenneth J. Doka is a licensed mental health counselor and preeminent expert in grief. He is Professor of Gerontology at the Graduate School of the College of New Rochelle as well as Senior Consultant to the Hospice Foundation of America and an ordained Lutheran minister. Dr. Doka speaks around the world on dying, death, and bereavement, and his work has been featured in national publications and media outlets such as Time, The Wall Street Journal, CNN, and Nightline.